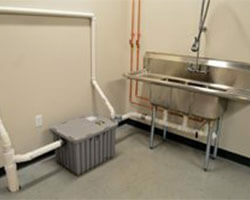 The point of a grease trap is to keep grease out of the sewer system. However, a grease trap has to be maintained in order to be effective. When a grease trap goes too long between cleanings, the grease can leak into your restaurant’s drainage system, leading to grease buildup and clogs. The effects can even impact your city’s water system, causing sewers to overflow. If it’s traced back to your restaurant, you could face some hefty fines from the city. In order to cut down on how much grease actually reaches the traps, regularly cleaning the grease machines beneath your restaurant’s sinks and the interceptors can be a great help. While it may seem like a hassle to clean these things once a week, you’ll find that keeping up with them makes the job much easier, as well as significantly cuts how often you need to get the traps cleaned.